Place the couscous grains into a bowl and pour over the hot chicken stock. Cover the bowl and leave couscous to soak the stock for 15 minutes or until tender. Meanwhile, toast the pine nuts in a dry frying pan for 3 minutes, shaking the pan from time to time. Set aside. 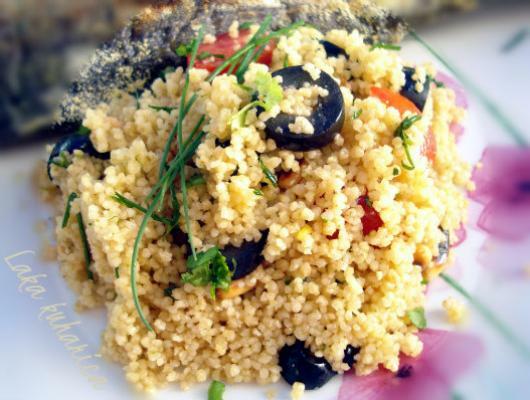 Run a fork through the couscous to break up the grains and add olive oil, black olives, tomatoes, toasted pine nuts and herbs. Combine. Season with pepper and serve warm.